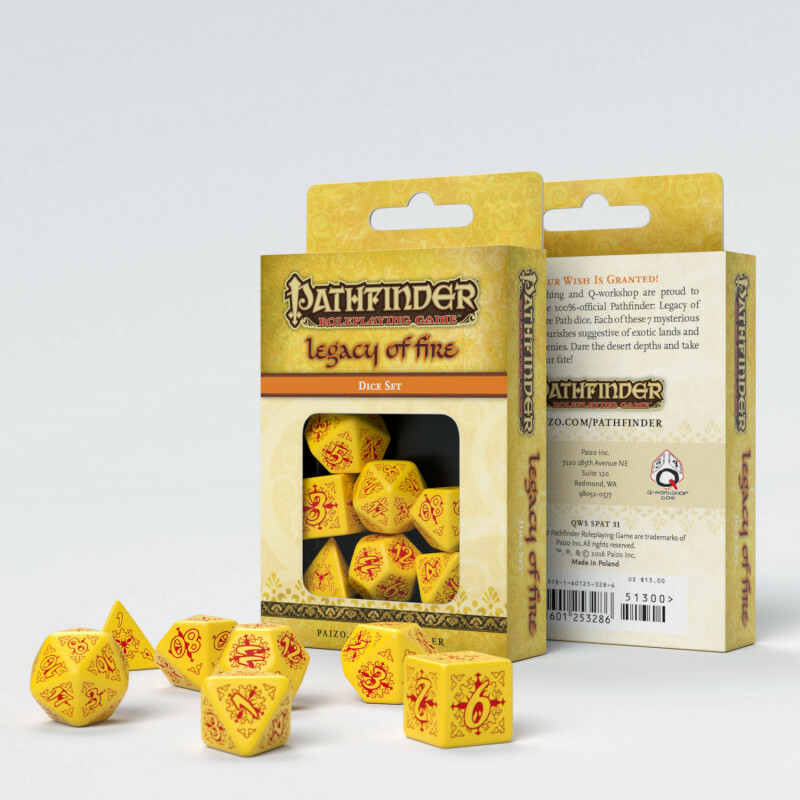 Q-workshop and Paizo Publishing are proud to bring you the 100%-official Pathfinder Adventure Path: Legacy of Fire dice. These masterfully crafted dice feature red engravings on yellow polyhedrons. When we were creating this set of dice for the fourth series of the Pathfinder Adventure Path: Legacy of Fire by Paizo Inc. we set a difficult task at Q WORKSHOP. How to create dice to a thousand and one rolls? This Pathfinder campaign is inspired by Arabic motifs and, as the authors themselves wrote: "Legacy of Fire is just about a lonely genie looking for a little love". And here are our first dice for Game Masters with the talent of Scheherezade. These beautifully made dice in yellow, decorated with red patterns, were made of the best material and engraved with embroidered arabesques. Of course, there are Arabic numerals on them, very readable for the whole world. Everything would resemble a burning fire in the desert or an angry genie, and they fascinated everyone who looks at it. It's the dice to tell stories, to the endless days and nights of the adventure. They are intended for the campaign in Golarion, but we suspect that they will inspire yet another thousand stories. The matrix for their cast is still kept in a pot filled with grains of the best Arabian coffee and cardamom. These dice are really saturated with exotic tales and the atmosphere of distant lands. 6. That the last wish will not be spoken - The Final Wish.